Continuing their road trip across Scotland, Charlie Ross and Margie Cooper begin at Abernyte in Perth and Kinross, before heading to an auction in the Highlands at Dingwall. with Charlie Ross and Margie Cooper. -We're going even further north, aren't we? -We're going up over the Cairngorms. You'll never be seen again! where just about everything started at £1. But is he bitter? an equally hairy time. Oh, my! These are in incredibly good nick. which made a mere £5, much to Charlie's amusement.. I just had a bad buy day, didn't I? Do you have a migraine or something? she's amassed a total of £221.82. You won't get fat on that lot! with £238.28 to spend today. that's famous for livestock, fruit and veg. our early starters seem ideally placed for a bumper crop. If I may say so, Gladys, it looks a little posh for you. You'll nae find things for £4.50 here, my girl. -Have I got to go in here with you? -I'll lead you to paradise. Lordy! Get a load of this! all arranged nicely over a huge area too. Think I'll go back thataway. I wonder how many items there are in this establishment. so manager Margaret could be essential. Could you give me a quick whistle-stop tour? -Just so I can get the lie of the land. Obviously, the cabinets with jewellery, etc, silverware. -Are you following this, Charlie? -Round here, we've got ceramics. Meanwhile, Margie's unearthed something even more valuable. A rare breed in one of these places. A dealer! -Right. Is that one of those luckenbooths? -That's quite a modern one. -An old one. Have a look at that one. and it's 1903 or something. -if you hang a horseshoe up, the luck falls out. -You're not Scottish, so how do you know that? I don't think that only applies to Scotland, Margie. -How much would that be? -How much have I got on it? 40 quid? That's way out, for me. What do you want to pay, then I'll tell you where to go? while Charlie practises the lowest form of wit. She could lose another 30 quid. He wouldn't let it lie, would he? -Are you looking for something for 5p? That's a nice little thing. Don't think you'll find any chips on it. -You can have it for a tenner. -Now you're getting to know me, aren't you? And Charlie looks a bit boggled. Perhaps the scrutiny is proving too much. -Should we have a waltz? Oh, do stop it, you two. I can't help feeling you're not taking this entirely seriously. -This isn't buying anything, is it? I really do think someone should make a start. -Promising. Maybe the waltzing worked. Ah! It's a little travelling, folding book-rest, I assume. Or it might just be upside down? And it's a little table as well. -I wonder what Margaret can do on that? I've just seen this little thing. So, what could be the best price? The best price on that would be 30. And that's the end? That's the absolute...? -It's a sweet thing. OK.
which leaves Charlie still on the lookout...for a dealer. -Ah, another man in residence here. -Hi. I'm doing well. Charlie's the name. -Gavin Morris. Nice to meet you. a wonderful time here, but I have to confess, I have spent nothing. -Can you alter that for me? -Ah, what about your... Is this a swagger stick? It's very short, isn't it? -Can I look at your swagger stick? -I mean, that's not silver, is it? -To be fair, it's plated. Anything else on that theme? How much is your drum over there? Is that lots of dosh or...? -They make them into coffee tables. -Probably why you sell them! The big ones, yeah. It's a nice drum. not that they mean anything to me. Or a nice crest. That doesn't have either, but it's in good condition. I've got to try and buy something at your cheaper end. Not going to try to beat the price down then. But we're definitely getting warm here. Cor, super stool. I think that's probably money, though, isn't it? -Is it? Is it really cheap? -It's lost a few of its bits, hasn't it? -A few of its ears have gone, yeah. I like the cabriole leg. -having said that, it's not really a French cabriole, it's an English stool. -I'd buy that at a silly price. -Give me a silly offer. It is silly, but don't smack me. Do you know what I think that'll make at auction? -I think it'll make between 20 and 30 quid. I'd have to buy it for 15 quid. I'd give you 15 quid and run. OK, Charlie, it's a deal. Blast! I wish I'd said ten! I think Charlie likes it here. Now, what about that old friend? I don't think I want your swagger stick, do I? -then if it makes ten, I'll make £1. You wish you'd never seen me today! -We've had a good week, Charlie. -Have you had a good week?! Seems you picked the right time, Charlie. Off the mark for just £23. and a bit more shopping. although it's not something Margie's particularly au fait with. items which come from a different continent altogether. These are, unusually for me, from North America. They're from Gatlinburg in Tennessee, those particular ones. so each of those is going to be 1,000 to 1,500 years old at least. Some of them might even be older than that. general sale in Ross and Cromarty. Anything else, John? A little set of opium scales. Now, those are very affordable. A set like that, even with the ivory, that is just a £20 piece. Right. And that's opium scales? ..the ivory pans on them are. the 1947 CITES Agreement to trade ivory from before that year. and feeling a bit out of her depth certainly isn't helping. These are old Burmese puppet heads on stands. Yeah, these were used as puppets in Burma. -No, they've got some age to them. but they're probably about 50 years old. old folk tales and things. Do you think they're a bit of fun? What do you think? Antiques can be very boring. and now she's after an opinion from the auction house. You don't think so? Not advisable? But not Asian social history? but I don't see any Scottish antiques in this shop. but it might be a good thing, who knows? Good work, John, but now Margie's got to either buy here or wait till tomorrow. Right, well, it's down to me to make a decision, isn't it? Yes, come on, Margie, you can do it. The best on that... I'd say £12. That's a bargain basement price. And what about the old puppet heads? and the puppet head for 25? That does sound like a very good deal, Margie. -So the two for 25? Oh, for crying out... What am I worrying about? You're a pal. Hopefully they'll do well for you. Which puppet head are we going to go for? Which one do you like, John? I think this one in the middle here's quite a good colour. I'll have him, then. Done. village of Newtonmore to find out about a uniquely Scottish sport. Pleased to meet you. Welcome to the Highland Folk Museum. and quite a few other parts of the world where Scots have migrated to. And at Newtonmore, they're very good at it. champions for the last three seasons. times, although the game itself is ancient. When did it all begin, historically? And it grew through the centuries to become training for the clans. Teams playing, clan against clan. So it's a very, very old sport. I'm just looking at the club. Are they called clubs? Caman comes from Gaelic, which means crooked. sports which share a reputation of being a bit on the dangerous side. This is an early caman. Do you want to feel the weight of that? it doesn't look like a sporting implement. with the two equal sides. Is there a particular wood that it would be made out of? Yes, ash was the most popular. Here we have some "leathers", they're called. There's cork inside, wound round with thread. This is the more modern one, this is what they play with today. Yeah. It's a pretty hefty thing. If that hits you, it's not going to do you any good, is it? -It can be very painful. -It must go at some speed? It can go up 100mph. That's hugely dangerous! Do you wear a face guard? No, they don't wear face guards at all. I'd love to see somebody playing it. Absolutely! I'm up for anything! Blimey, Charlie, you just be careful out there. I've been sent out here for a lesson. John. Nice to meet you, John. Here you've got the shinty stick. I have one here for you. The basics of the game are quite easy to follow. It's to hit the ball - I'll hit the ball to you, and stop the ball. Now you stop the ball with your two feet. Hit it back, I'll demonstrate. Two feet always, push it to the side and hit. Was that good? Was I a natural? That was natural - you're a natural. it, it's important that the ball arrives in the back of the net. It can be there all day, but if it's not in the back of the net - no win. Well, at least no-one is likely to get very hurt in a penalty shoot out. With Charlie on the spot, even the goalie's probably safe. I must say, that goal looks a bit narrow. And he looks enormous. so I'm hoping that I'll be able to strike the ball. I'm sure you will. Cor blimey O'Reilly! Like falling off a log, isn't it, for you? -Charlie, it's your turn now. -Are you ready for me, Jamie? Oh, dear, that was pathetic, wasn't it? Perhaps there's something in this talk of his Scottish roots after all! Just don't expect Margie to put up with a blow-by-blow account, Charlie. Next morning, Charlie Ross is a man with a clan. -We're very near my home seat. You sort of feel comfortable up here? Back with your "ain folk". spaces, cos yesterday they were both very careful with their cash. Are you looking for something for 5p? but first, at their furthest point north, they're going to buy there. the one the Bard based his tragedy on, was born in Dingwall. local football team Ross County have a stag mascot called Rosco. Charlie should look him up. -Hey, this looks all right. fit in extra stock...and Charlie. Oh, my goodness gracious me. All the usual suspects are here, as well as one distinct speciality. Taxidermy is my particular field. -That's very specialist, isn't it? -That's been well done, hasn't it? -Sell a lot of stags' heads. Well, you would here, wouldn't you? A little "deer" for a hat stand. But while Margie admires William's creatures, Charlie's crept back in. Looks like he's found something too. Would I normally look at a biscuit barrel? No, I would not. definitely say it is the Rolls-Royce of all biscuit barrels. It is £75, which I think is hugely competitive. Cos at that price, if the glass is damaged, we have une probleme. There is a bit of a crack in it there. We could try William - you never know. until I saw this and I thought, "Oh, crumbs." -At auction, it could make £30-£40. I could do 30 on that, sir. -What were you looking at? I love the Arts and Crafts look of this box. Yes. I just love the hinges, I love the work around the base. That's a fair bit of silver. and the other attraction, to me anyway, is that it's Irish silver. -I think that will put a slight premium. I think, at auction, it might make something around the £100 mark. -I don't know where you can be on it. Well, I could do 100 on that. -I'm going to carry on looking around and I'm going to bear those two in mind. I'd be quite surprised if I walked out of here without them. Charlie seems smitten with those, and he can certainly afford them. But what about them birds? Going "cheep"? You've got some interesting stuff. Yes. Yes. This is particularly interesting. These are little flower crafts. Yes. Made out of seed. It's made out of seeds and leaves. These are very nice, but I'm a bit scared they're a bit modern. Eh, yeah - but I think they will sell. They look all right, don't they? Those are sweet, aren't they? so careful has she become. Not something we could say about Charlie though. A Victorian inlay rosewood table, with no price on it whatsoever. I can only assume it's free. It's missing its gallery on the bottom. We're looking at £90, but there's room for negotiation. It's a great bit of rosewood. It's beautiful and beautifully inlaid. Edwardian. It's 1900, 1910 perhaps. what they call the Sheraton Revival period. -Look at this inlay here. Look at the swags and floral rosette. It's just beautiful. Couldn't be 50 quid, could it? To an old man? Blimey, you said that a bit sharpish. I think we might be about to get down to a deal on the other items as well. I love the cigarette box. I think it would make about £100 at auction. If we said 110 for the pair...that puts you back in the ascendancy. 150 for your table, your biscuit barrel and your whatsit. -Do I get a bulk discount? -I can do 150 for you. I think that's kind of you. And I've even got money! So, £150, but what went where? I'm quite happy with the biscuit barrel at 30.
and let's call the silver box 80, which is £150. And there should be a profit there. Back inside, Margie's made another find. That's nice. Papier-mache - just pressed paper. It's a shame about that, isn't it? -Yes. Lot of work gone into that. It's got a little bit of wear and tear and damage, hasn't it? Well, yes. Yes. Yes. Probably a long time ago. It's mid-Victorian, which is lovely. Increases your advantage on him. So is that the absolute...? I could do £30 on that for you. And that's the end? So 25's out of the question? I think 25 would be out of the question on that one. Well, capitulate and that will be a wonderful purchase. just around the corner, I wonder how those lots will fare. from Dingwall to Fortrose, on the Black Isle. -It sounds fabulous, doesn't it? The Black Isle. Fortrose also features an antiques shop of that name. I've got enough money to do what I need to do. Good afternoon. Charlie's the name. -Patricia. Nice to see you. I think Charlie's a bit disappointed to have come here last. Sold, sold - lots of sold stickers. Very good sign to see sold stickers in a shop. with one of his other purchases, to make a joint lot. A Victorian spear. It's what I would call a pike, I think. but there might be a better match here. You haven't got a biscuit barrel of any sort, have you? Oh, the plated Wedgwood one? It's probably quite expanseive, is it? Not sure what I've got on the ticket. but I think Wedgwood's a little bit old-fashioned. What's that going to make at auction? That looks a bit more like it. Would that fit with the one you've got? I think it would rather. Lovely shape - pineapple shape. It's not expensive, is it? hoping that it might be even cheaper. £18. How much could that be? That's all right. You don't want to sell me that for a tenner, do you? Would it be nit-picking to say £12? I like it. I really like it, it's proper quality. That's sweet of you. Thank you. I'm sorry I haven't spent more money with you. I won't be retiring today. by the local inhabitants of the area. that were created by the Picts during the 8th and 9th centuries. in the time of the Romans and the time after the Romans. they survived as an independent group of people. these remarkable artefacts were not in the least bit treasured. were unfairly disregarded as a bunch of violent and uncultured savages. of what somebody thought a Pict looked like. And unfortunately, this has coloured opinion for too long. such wonderful sculpture as we see here? which dates from the first influx of Christianity to Scotland. The Rosemarkie Cross slab is our centrepiece. of Pictish art traditions with Christian art traditions. but on the other side is a collection of Pictish symbols. in penetrating their long-extinct language. are surely hidden in the stones themselves. because we've got a conjunction of things here. very easy to identity, set inside a very complex patter of key work. there was an important Pictish influence here. It has a number of symbols on it. with what looks like a V across it, a big V.
Well, the problem is we don't really know what they mean. Are you ever going to know? -The most likely thing is that it's people's names. either cos he's dead or he erected the stone. It's a monument about people. and their sculptures, including those at Rosemarkie, restored. and Celtic design on the Arts and Crafts movement, for example. it's called The Early Christian Monuments Of Scotland. as he could find, drawing them and copying them. the existence of these stones. as can be seen in several pieces of jewellery the museum's acquired. from the crescent symbol that we have on the Rosemarkie Cross slab. directly inspired from the Rosemarkie Cross slab. bought very little to compare with any of these. But let's take a look anyway. A small stool in the form of a 17th-century refectory table. Not a book stand, then? -It's nicely made, isn't it? -I thought it was rather sweet. -I think there'll be a profit lurking in there. -Saw that. But it's very nice. Yeah. The gallow is lovely, isn't it? No, no, no, but it's in that style. Those are ivory pans, which is quite unusual. -That's quite unusual. 30 quid? What's this? I don't know what this is. This is a bit of a mystery. -It's a Burmese puppet head. I think he's about to be rude. It's a nice mix, isn't it? You have something for every taste. -You've made mine look like a charity shop. -Don't look at it too carefully. Here. But it's a nice cabriole leg. I thought that had a sort of Pugin Arts and Crafts look about it. but it's 11 ounces of silver. It's been a fabulous thing. Faint praise, if every I heard it. That is rosewood, which puts it into a different class. -I have sold many of those in my time. -It's going to make...I reckon about 145. If that makes £100, I'll take you out for a slap-up dinner. -I think it'll make £45. -And you're going to have to pay for my dinner. She bigged-up my items again. She thought the table was fabulous. She's living in the '80s, like me. and on his lovely octagonal rosewood table. It's a mixed bag, my dear, it's a mixed bag. The bust on the stand is absolutely ghastly! at an auction in the county of Ross and Cromarty, at Dingwall. -Have you seen where we are? We're in the middle of a forest. Have you got a rug? Should we just pull in and have a little romantic picnic in the woods? Instead of sitting in that auction room, cringing. of the country, they shift a lot more heifer than Hepplewhite. of what our two have herded in. The bird pictures - not the most sellable item I've ever seen. I'd be surprised if we get anything more than £5 for those. The rosewood occasional table - it should make about £150 to £180. and I would be hoping £40 to £60 for that. and he's spent £185 of it on five auction lots. and she's parted with exactly £100, also on five lots. OK, gavels-a-go! Or are they? -He's not got a normal gavel, just a long stick. He's quite vicious with that stick. I think he's lost the end off it. Charlie's swagger stick - any sergeant-majors out there? Ten bid. 12. 15. 18. 25. 28. 30. At 30. At 30. At 30. At 30... Five! 50. At 50. At 50. Wow! This bodes very well indeed. What impeccable taste they have here in Scotland. Any chance of Margie's birds taking off? I don't think much of the cataloguing. -"Two bird pictures composted from seeds and mosses." Five. Bid. At five. At five. Eight. -I've got out of jail now. Five. At 35. 35. 40. Five. At 45. 45. 45. 45. 45. 45. At 45. 45. 45. 45. Paul's doing a great job. Now for Charlie's wee stool. At 30. At 30. At 30. At 30. At 30. At 30. That's what you can get when the auctioneer aims high. But Charlie's biscuit barrels could be a trickier prospect. And we'll say £40. 40. 20 bid. At 20. At 20. At 20. At 20. At 20. At 20. At 20. At 22. -We need to go on. Come on. 38. At 38. 38. 38. 38. 38. Crumbs, it was almost a lot worse though. Burmese puppet heads and Rouge Royale? We'll see. But at least it'll have a novelty value. Please don't make a profit on this. At 35. 35. 35. 35. 35. 35. At 40. At 40. At 40. At 40. -I should have bought five! Never mind. Got the gear? -She certainly got a profit. Will her opium scales weigh in with more? I'll just sell you the scales, you can get your own opium. At 30. At 30. At 30. At 30. At 30. At 55. 55. 55. 55. 55. It seems that Dingwall likes a novelty. Charlie's table's up next, but do they know it? Enormous print for Margie's things and my table is in tiny, tiny print. the table's even in the auction. At 50. At 50. At 50. -Hold it up, man. Hold it up. At 65. 65. 65. 65. -Now we're going. Come on. At 70. At 70. At £70. A lot less than the auctioneer had hoped for. Tell me, Margie, what is your secret of your success? Is it just pure luck or is there any skill involved? the auctioneer's favourite, should do fine. £30. 20 bid. At 22. -Now, what about her practical papier-mache? -He's got it at 50?! You only paid 30. At 50. Five. 60. Five. At 190. At 190. At 190. £190 it goes then. At 190. A round of applause and a whacking great profit. Well done. I was really quite enjoying my road trip until that minute. but Charlie's risky silver box gives him one last chance. Bid. At 50. At 50. At 50. -We're not even scrap value yet. Five. 100. At 100. 100. -It scraps at more than this. -At 100. £100 it goes then. At £100. -Oh, it's 11oz of silver. That disappointment leaves Charlie firmly in second place. Margie, I have to say, I'm working with a pro. leaving him with £305.84 to spend next time. leaving her with £429.32 and a healthy lead. Take you away before your head gets even bigger. -There you are, my dear. to be thrashed by you. -Hello, madam. How much is that worth? £45? You can't get tighter than that, can you? 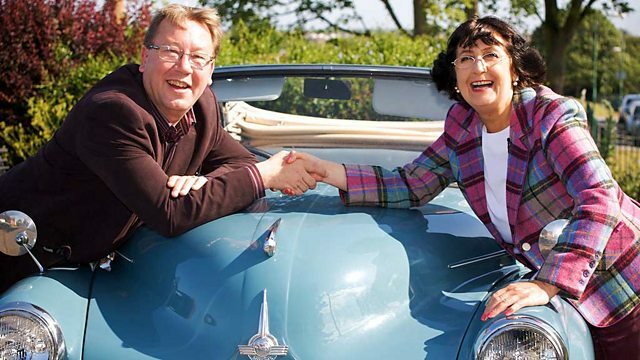 Continuing their road trip across Scotland, antiques experts Charlie Ross and Margie Cooper begin at Abernyte in Perth and Kinross, before heading to an auction in the Highlands at Dingwall.